Before we see their inspiration we have a little of our own inspiration today with the launch of our brand new Collection which is available to order now....pure unadulterated Girl Talk with our new Dollie Daydream collection - it's so pink and girly gorge, we all LOVE it! If you order now you can also save 15% in our SALE! Just click the image! No 26 Lexie - well done Lexie!! You've won the brand new Dollie Daydream collection above! Woohoo!! Email us here to claim your prize! 15 Mirella, 2 Donna and 23 Julie - you've all won a download so please use the email link above to claim your prize and grab your blinkies from the sidebar! The winner of this week's challenge will win the new Dollie Daydream collection so make sure you enter this week - don't forget you have until Thurs 9th January to enter! 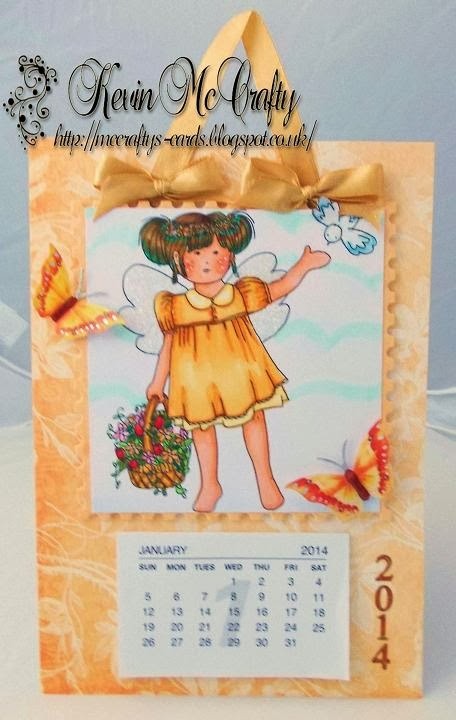 Anjie - For my DT card this week the image I have used is the Fredericka Debutante Digistamp which is available as an instant download. She is coloured with my Graph 'It Markers. The papers are from the Girls Hoot Download Bundle which is also available as an instant download. I have distressed the edges of the papers and used a distress ink around everything, and then added some faux stitching. I have also added a few die cuts, some lace, rolled flowers and a sentiment. Debbi - Happy New Year All!!! With the start of the new year I thought I'd make a calender. 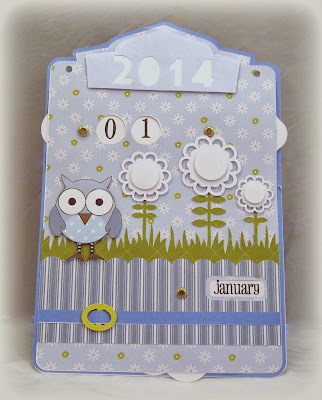 The calender itself is a downloaded cutting file from Silhouette which I then upload the patterned papers from the Boys Hoots download bundle into the software and then cut the pieces out and assembled. To finish of I just had the add the co-ordinating Owl. Zoe - I love the thought of a New Year party, though I confess I'm always tucked up in bed long before midnight having had a quiet evening at home. So I decided to pretend I was hosting a party and designed a few items using the gorgeous Classic Hearts/Wedding collection to design an invite and a place card. I also used the fab Emma Canning Cute as a button image to make a bottle charm/hanging to be put on the person's favourite bottle! Susan , Happy New Year to everyone . 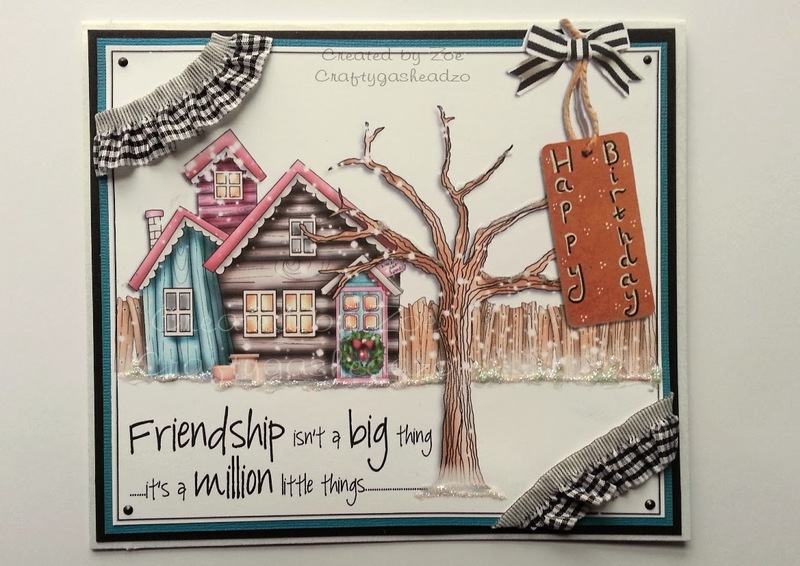 For my DT make I have used Fredericka Debutante Digistamp ,coloured with Graph'it markers and the papers are from digi bundle Classic Hearts ,If you pop over to my blog I have listed all the colours and things used. Sally - So this is my Digi Choosday - Happy New Year challenge. 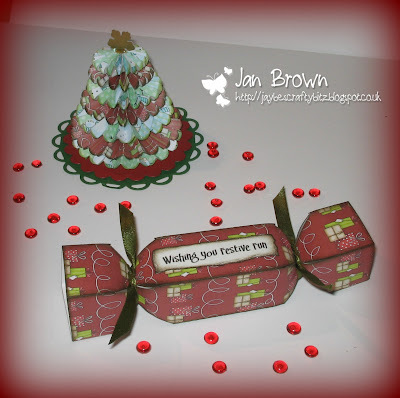 This is one of Emma Canning's December digi images. I printed her out and coloured her with my NEW Graph'it marker pens I received from my daughter Katie for Christmas! They are lush! I then cut her out added a little glitter and matted her on to some backing papers I had in my crafty stash and added a sentiment using my ticket punch from Stampin Up. There is my card. Voila! Kevin Happy New Year to you All, this week I have made a calendar for 2014 using this gorgeous Sugar Plum digi image from Polkadoodles coloured with my Graph'it markers. So there's the inspiration for today! I'm sure you'll agree that they're all superb makes again this week, love love love all the work these guys have put in! Just one more sleep and it's here! All of us on both the Digi Choosday and the Polkadoodles team would like to take this opportunity to wish you all a very Merry Christmas with your loved ones and we hope you have a super festive season with stockings stuffed with stash! so if you can join in then feel free! Well done Sarah, you won a big download bundle! Well done everyone! Please all email me here to claim your prizes! Anjie - As it was my wonderful Husbands birthday on the 21st I made this card for him. The image is Jock by Emma Canning and is coloured with Graph 'It Markers. The papers are from the Boys Hoot Download Bundle. I've used a distress ink around the edges of everything and added faux stitching. I've also pierced the card around the image to give a more realistic stitch effect. 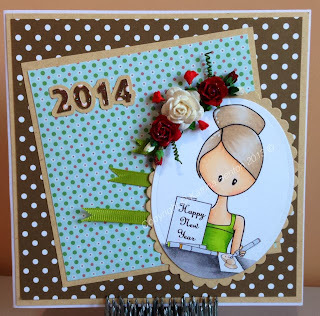 I've added some dies and sentiments from my stash. Sarah I was unsure what to do with a Christmas birthday theme - until I remembered this lovely sentiment and then inspiration struck! 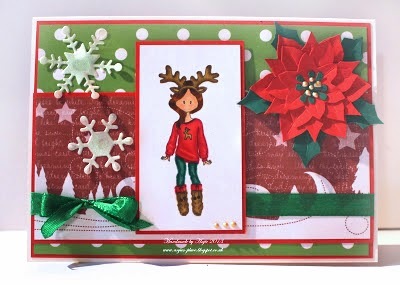 I used Christmas Sentiments 1 Download Bundle, lots of shimmering card, an embossing folder, a Nestabilities and a flower die, ribbon, glitter glue and a gem or two. With some ink for definition on the sentiment I think this would make someone a lovely winter themed birthday card - well I hope it would anyway!! And it didn't even take that long to make! Zoe - Birthdays always seem to be forgotten around Christmas, but not by us! Here's my card using the gorgeous Emma Canning Birthday Wishes I have coloured her in seasonal colours and even coloured the candle glow! I kept the card clean and simple - a spot of sparkle on her leggings and some colour matching embellishments along with the stamp which is a Polkadoodles sentiment finishes it all off. 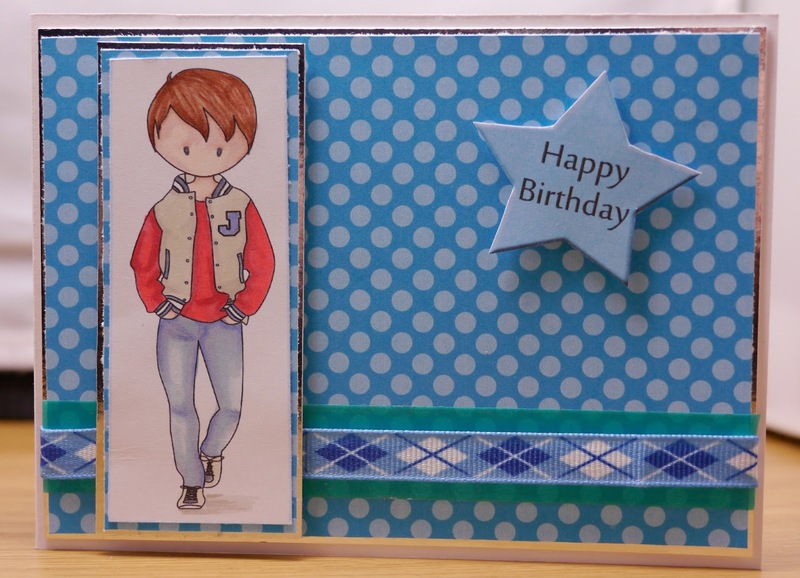 Jo- It was my little brother's 13th birthday last week and I made this card for him using the Emma Canning digi Jock and a paper and star embellishment from the sugar boys download collection. I added a sentiment to the star in my graphics program and used blue washi tape and patterned ribbon for dimension. Christmas birthdays are hard to make for, but teenage-boy, Christmas birthdays are a challenge and a half! Susan ...This week I have only used things from Christmas Joy and no colouring at all. I have used Craft Artist to put together most of the elements ,then just mated onto one of the papers from the digi bundle added some sparkle and snowflakes .This is for my granddaughter she will be 14 on Boxing Day. 3. MAXIMUM of 2 entries allowed! We hope you all have an amazing time over the festive season! We also have a little heads up for all you colouring fans out there - you can catch Nikky on Create and Craft TV today at 11am with another Graph'It show so if you love colouring make sure you check it out on Sky 671, Freeview 36 or you can watch online at www.createandcraft.tv. and they've done a great job! so we hope you all play along with us. The winner of this challenge will receive a copy of the fantastic Picknix 1 Collection which is just fabulous and worth £17.99. 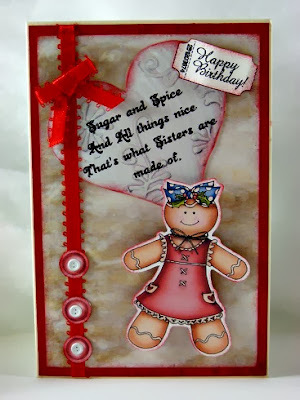 Karon - It was my daughter's birthday at the end of November and I had to make a card off her Sister. The images and paper are from the Studio 12 Picknix 2 CD, Gingerbread Twist. The main sentiment I made up and typed in Word. The little ticket sentiment is from the Cherryblossom Lane CD. 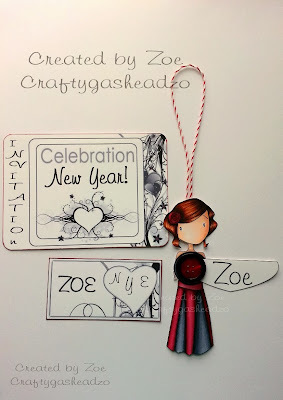 Zoe - As I have a friend with a birthday on Christmas day this challenge was perfect for me! 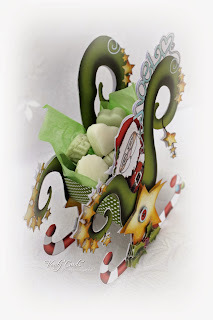 I used the gorgeous images from Studio 12 - Picknix Garden collection and I created this topper in Serif Craft Artist where I used digital brushes to add snow over the images. 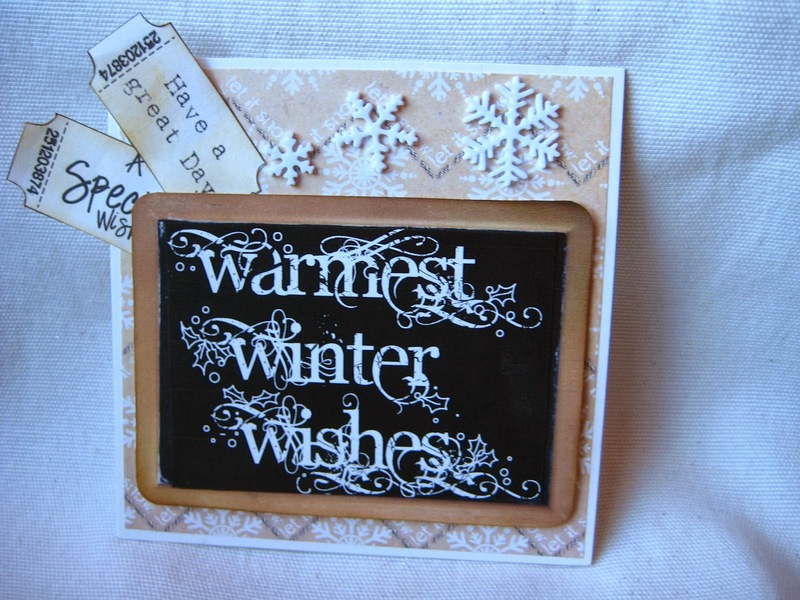 Once printed off I added some sparkle to enhance the winter feel of it, and some ribbon too. Simple matting and layering finished it all off. Sally - Christmas Birthday Card - I used my favourite image from the Home for Christmas CD Rom and coloured her with my Graph'it markers. Adhered her to some background papers from my crafty stash if polkadoodle papers. Coloured a sentiment so it matched the colour scheme and there it is. 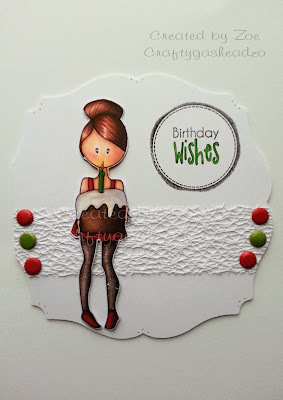 Asha - I made a birthday card with a Christmas flair. 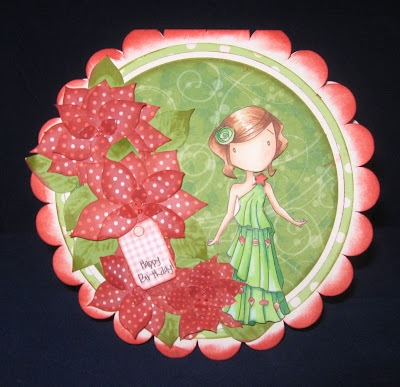 The papers are from PickNix 2 CD Gingerbread Twist and the image is from the "Angelberry" CD. I don't think this card needs too many embellishments. Some ribbon, a few bling and Crystal Stickles on the angel's wings and I'm done. This will do nicely for my friend whose birthday falls on Dec 27th. Miria I made a Christmas birthday card for a male or maybe for a teacher. Paper and sentiments are from cd Studio 12 Picknix 2,the blackboard is from cd Studio 12 - Picknix Garden collection . I just distressed the edges and added some die cut snowflakes. Rebekah - It's my daughter's birthday tomorrow (when did I become a mother of a teenager?!) so I made this card, perfect for her, in pretty pinks and creams. 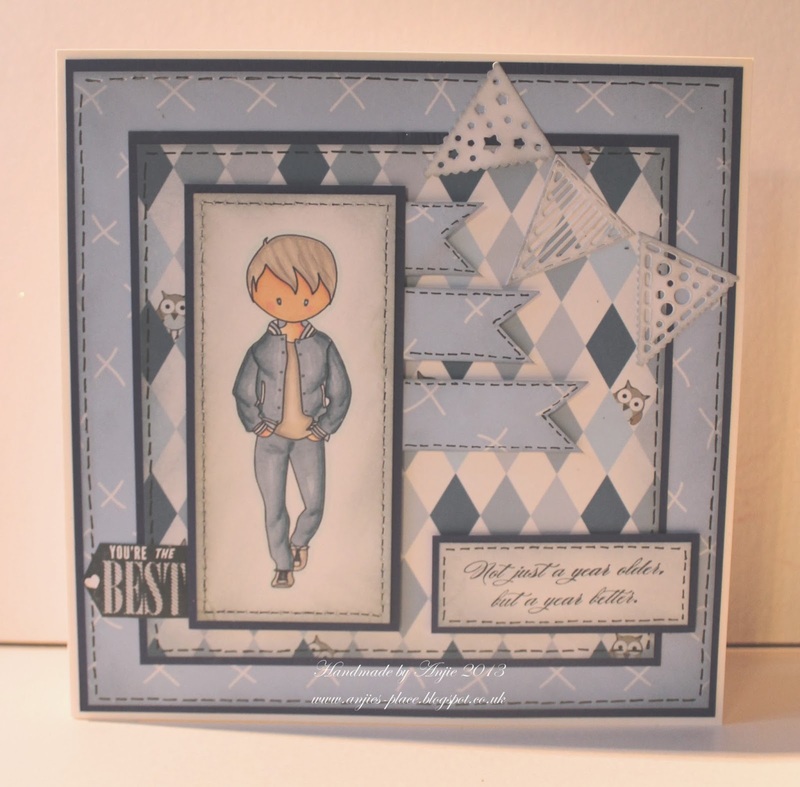 The papers I have used are all from Picknix cd rom 1 from the All sewn up collection. My image is one of the cute Emma Canning digis at Polkadoodles and the cute leather effect ta is also from the Picknix CD, check out my blog for more details. So there is the inspiration from the team this week - gorgeous Christmas Birthday cards all round! Well done! Email us here to claim your prize! Well done everyone - grab your blinkies from the sidebar! Merry Christmas to you for the festive season and we hope you get time to enter the challenge! Closing date for the challenge is Sunday 29th December at 12noon GMT and don't forget to link your actual blog post so we can come and visit you! 3. Maximum of 3 entries per person! Good morning it's Anjie here today with a Studio 12 project. This started out life as plain MDF triangles from the MDF man. I knew straight away what I wanted to do with it. 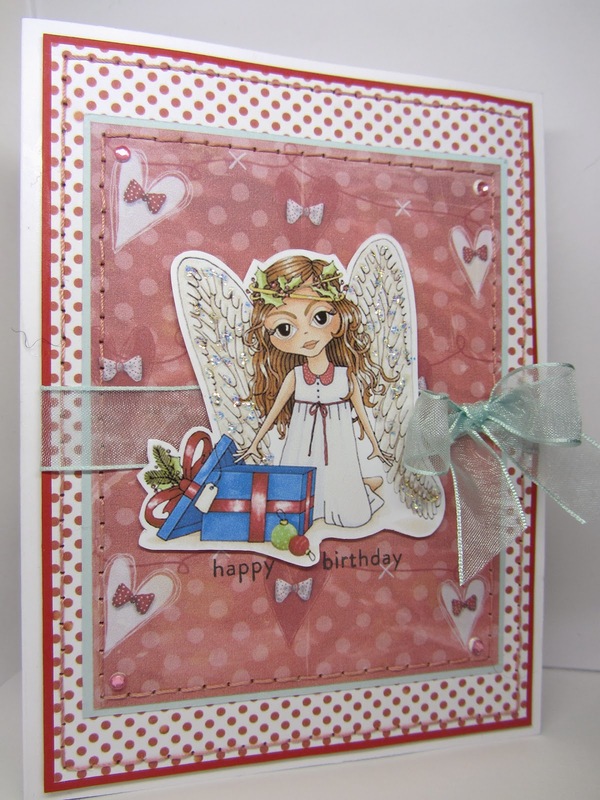 All the papers and embellishments are from the fabulous Studio 12 CD-rom Picknix Collection 2 Gingerbread Twist. I glued all the papers on and used a distress ink around the edges to give it an aged look. I then added some faux stitching with a white opaque pen. I then cut out all the embellishments and also aged them with the distress ink and glued in place. I threaded string through to hang it as I thought ribbon would look odd with it having an aged look. It is now in pride of place behind the bar in our party room. Here are a few close up shots. I will treasure this and it will be brought out every year. 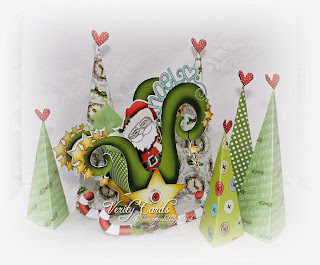 Digi Choosday Wk 9 ....Anything Goes challenge with a Ho Ho Ho! Hi everyone - he's nearly here! Not many sleeps to go now! We hope you join in the challenge with us - you have until Thurs 26th Dec to enter and our random winner will be announced on Tues 31st Dec. The winner of this challenge will get a great download bundle worth £10 and our 3 runners up will also get downloads too! I have cut the poinsettia from a template I have and added some cosmic shimmer for the centre. 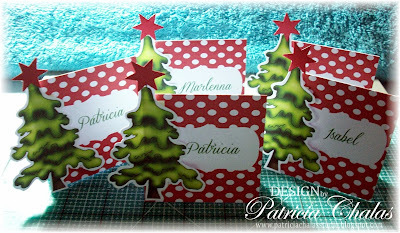 The snowflakes are cut using a Marianne D die. For my project this week I decided to make a Christmas Tag , I love using lots of white and that owl is just cutest. You can find the owl and many more on the Christmas Joy download bundle already pre - coloured - I have used Distress Ink for just a touch of colour along with some ribbon and lace. Sarah -I took the 'Ho Ho Ho' literally and made a card with Father Christmas on it!! 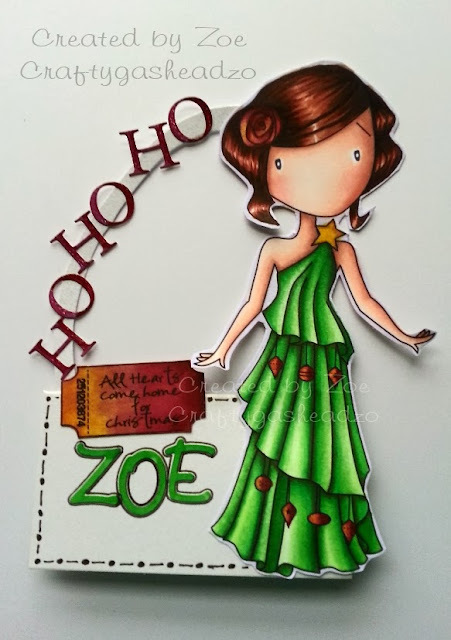 The image is an Emma Canning digi - Sooty Santa - coloured in with my ProMarkers. I added some brick detail to the chimney pot after I'd coloured him in - cut him out with a Nestie, chalked for a background and dotted some glitter glue about for a bit of bling! Papers are from Paper Boutique II and the ribbon, sentiment and embellishment from my stuff. 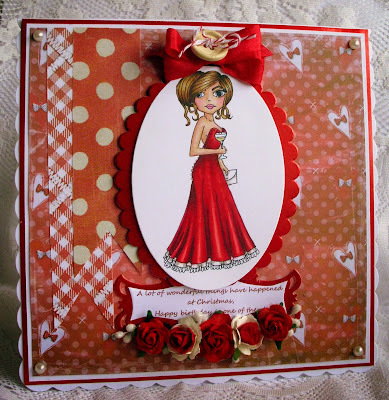 Zoe - This week I used the gorgeous Bauble Gown digi by Emma Canning as my main image to create a place card for my Christmas table. I coloured her with a mix of markers including Graph It's and added letters that I coloured to match as well as the sentiment ticket to finish it all off. 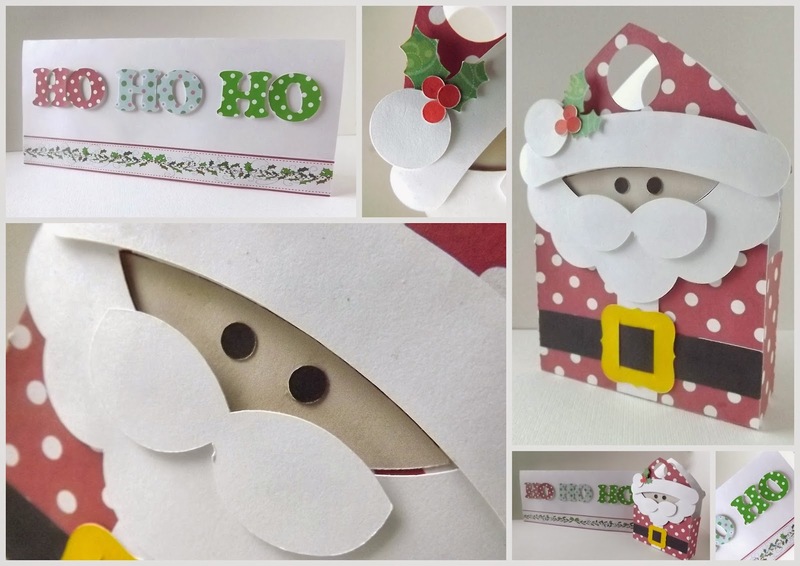 Debbi - Well, it's nearly time for the man in the red suit to visit us all, so this week I have made a cute little Santa gift bag and matching 'Ho Ho Ho' card using the Christmas Joy bundle. I used foam pads on most of the pieces to give a 3D effect. Jo- For my project this week I had to use one of the cute pre-coloured toppers from the Christmas Joy bundle. I added some red gems to the owl's santa hat and combined some shop bought flowers with a rolled rose made from some of the left over paper I had printed, I didn't want to waste anything! Sally - So here we are again! Ho Ho Ho! Santa will be here soon. 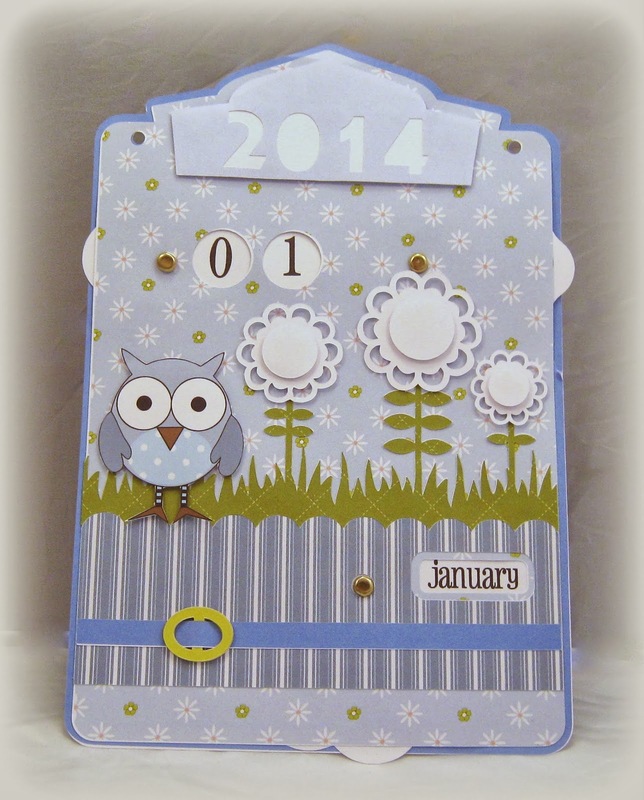 I chose this cute owl from one of the digi bundles Christmas Joy and the backing paper and printed them out. So quick and easy. 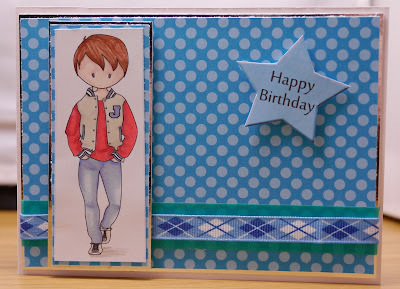 I cut out a scalloped circle using a Spellbinders die. I then matted the backing paper on some red cardstock. Cut out a bow and printed a sentiment from the Home for Christmas CD Rom and there it is. Susan My make this week is a Christmas decoration, I have used a cheap mdf house which I painted with white gesso ,added some modelling paste for the snow ,red pleated ribbon and other bits n bobs. the papers are from Christmas joy download bundle and the Christmas angel is from angelberrys digi download and coloured with Graph'it markers. No 37: Ellen - you won £5 of downloads woohoo! Ellen email us here to claim your prize and everyone grab your blinkies from the sidebar! Wk 50 - Polkadoodles and Studio 12 Challenge - Anything Goes! You have until 22nd December to enter this challenge so we hope you can find time to show us your lovely makes! The winner of this challenge will win a special Christmas Bonus stash of £30 of stash and our Top 3 faves will also each win a prize too! Ruth: I've used a church candle that I've had for longer than I care to remember! I've used the decoupage elements from A Home for Christmas and printed off a sheet of vellum from Here Comes Christmas and added it behind the decoupage. I curled the images over the table edge so they didn't stick out too much! 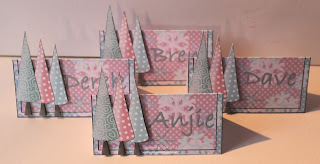 Anjie - For my project I have made some place cards.I used papers and embellishments from the A Home for Christmas CD Collection. I layered 2 papers in a graphics program and added a black border to make the top one pop out. I added the names in the program and then printed them out and printed out some of the trees to cut out and put in place with 3D foam. Lizzie - Oh I got so excited at this challenge so I made two projects !!! For my first project ....... Every year I make peppermint creams to have with coffee after dinner, so I thought .......... how about something to serve them in. I used the A Home for Christmas CD. Using the embellishment of Santa flying in his sleigh and blowing it up in my graphics program so I had the sleigh as big as I needed it. The paper for the bottom is also from the CD cut as a strip adhered to either side of the sleigh to make a place to hold my peppermint creams ! I added some tissue paper to make it look glam and of course I glittered the sleigh stars and words and Santa with my Stickles ! My second project was VERY quick and simple. I made these Christmas trees from papers from the A Home for Christmas CD I drew triangles and folded the paper ! I used a heart from the embellishments on the CD, adhered it to a cocktail stick and placed it down the top of the tree !! I thought they would look great in the middle of the table amongst the dishes stood in groups, but they also look great around my sleigh too !!! Bev I"m really struggling to get into the Christmas spirit this year so have needed to find things to make that are quick, fun and functional. So I came up with place settings for my table. I adore the little penguins on Here Comes Christmas CD Rom so used them, a backing paper, my graphics programme a little glitter and the off gem. A very quick make to add a special touch to the Christmas table. JAN - Here's my take on the Christmas table decorations using papers and a sentiment from the 'Angelberry Christmas CD' (which is currently available for just £7.00 at our on-line store). The Tree is made from paper rosettes (using a cutting die) and the cracker is made using a template which I found on the internet. Patty- For my inspiration this week I've made some Place Card set to put on every sits on the table when we sit down to enjoy our Holiday Dinner. 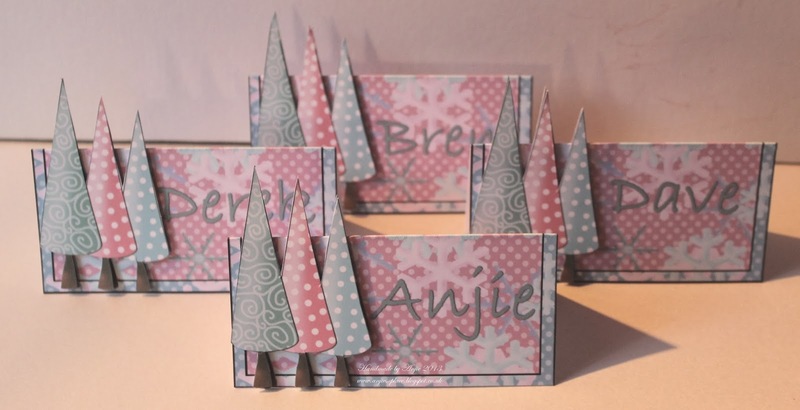 I printed the notes using paper from the Angelberry cd, and printed an cut out the Xmas tree from Here Comes Christmas added the cut out start on top and voula you have this amazing and easy to make placecard. Shell- For my inspiration this week I have decorated a candle to put on the table when we sit down to our turkey and trimmings. I simply printed our my fave angel from the Angelberry cd, added some ribbon and a flower ribbon trim and a snowflake cut on my cameo machine. Haven't they done a great job? I think we confused you with the wording on this challenge as we didn't have many entries so we decided that you were ALL our favourites on week 48 - go grab your Top 3 blinkie from the sidebar! Don't forget you have until 22nd December to enter this week's Anything Goes! See you Tuesday! 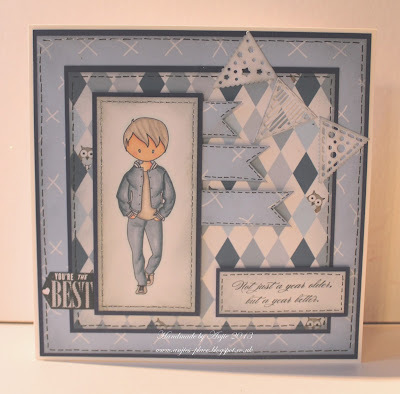 Hi everyone, Its Dee here with today's post for Polkadoodles Studio 12 range. I hope you are all looking forward to Christmas. I have just roused myself into starting the shopping, I'm very late this year *slapped wristies*. Anyway getting back on track I've made a real cute little wall plaque/tray/hanger/thingy! not really sure what to call it if I'm honest. This was a little wooden box that had wooden embellishments in it, I've had it knocking round the work room for a couple of years now. I always knew I would do something with it and inspiration hit yesterday so I hope you like it as much as I do. I used a few different stamps from the studio 12 and Susan Weckesser studio 12 stamps. I stamped them onto cream and clear shrink plastic with Stazon ink and coloured them in with Sakura Stardust and Kuratake's Wink Of Stella pens before shrinking them. They are tiny and really very sweet. I painted the box with mushroom and light blue acrylic paint then I used scraps of backing papers from the Studio 12 Collection 1 CD in each compartment. I added a few odds and ends from my stash to finish it off. I thought I'd do a pic of it with a ruler so you can see just how small some of the elements are. Enjoy the holiday season everyone, wherever you are. Digi Choosday...Wk 7 - Christmas Cheer!